New statistics on the number of animals used in research in the European Union reveal the UK as the third largest user of animals. The total number of animals recorded across the EU was 11,481,521. However, the breeding of genetically modified (GM) animals and harmful mutants has been excluded. GM animals account for 1.74 million in the UK (46%). Thus, the actual total of animal use in the EU is likely to be around twice the number currently published. EU figures indicate a 4% decrease but without the inclusion of the growth area of animal research, GM, the picture is incomplete. 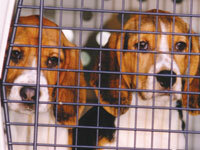 Donate now and help the National Anti-Vivisection Society fight the use of animals in experiments. EU primate use came to 6,095, with France, Germany and the UK the top three users, reporting 1,810, 1,770 and 1,459 primates respectively. There was alarmingly high dog use in Europe, 17,896 animals. Shamefully, the UK is the second largest user of man’s best friend, behind France. This dreadful statistic follows a recent rejection for planning permission for a beagle breeding farm in the UK read more here; a new facility could have fueled a significant increase in dog use. The most used species were mice (6,999,312) and rats (1,602,969). Other species included rabbits, horses, fish and “other carnivores” including foxes, badgers, seals and otters. “Other mammals” increased, including boars, bats, shrews, llamas, moles and red deer. No species is safe from vivisection. The EU data is compiled from 2011 figures supplied by 27 of the Member States, and 2010 figures from France.